﻿ How to Insert iMovie Video into PowerPoint Presentation? Home » video » How to Insert iMovie Video into Microsoft PowerPoint Presentation? How to Insert iMovie Video into Microsoft PowerPoint Presentation? This article describes how to insert iMovie (including iMovie '11/'09/'08) video into PowerPoint Presentation on Mac and embed iMovie video clips into PowerPoint Presentation. The inserted video can be played on any Mac and PC. You will never be afraid you or your PPT viewers cannot play your elaborate PPT video. According to Microsoft official site, one could not insert iMovie video because the video format is what PPT does not support to be embedded. PPD compatible video formats include files with the extension of .asf, .avi, .mpg, .mpeg, .wmv, .wmv, .asf, .avi files are unplayable on a Mac. The .mpg files can be played on both PC and Mac. Thus .mpg is the idea format for us to insert into PowerPoint Presentation which can be played on both a Mac and PC. 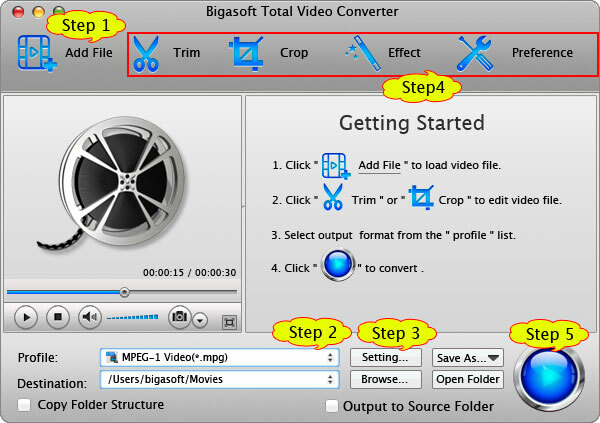 Download Bigasoft Total Video Converter for Mac and run it. In iMovie, open your project and locate and open the iMovie project that you want to export. Click "Share" On the File menu, select "Export using QuickTime". In the pop up window, name your movie and choose the folder where you'd like to save it. From the Export dropdown, select Movie to MPEG-4. Close iMovie after the movie is finished saving. Click the "Add File" button or directly drag the exported iMovie video clip to import iMovie video. Step 2 Set profile to MPEG-1. From the profile list, choose MPEG-1 Video (*.mpg) from the "General Video" category. In the "Settings..." windows, select 640*480 from the "Resolution" drop list. You may set lower or higher resolution if you want superior or inferior video quality. Click "Effect" button, you can customize video like adding watermark, subtitle, audio track, artistic effects. To join several chapters into one, click "Merge into one file" from context menu option. Set the destination folder and click "Convert" button to convert iMovie MPEG-4 format to MPEG-1. Create a folder which contains both your PowerPoint presentation and any embedded movies as separate files to keep the required linked relationship between both PowerPoint and multimedia files. Now, you can insert the converted MPEG-1 video into PowerPoint and embed iMovie to PowerPoint on Mac or on PC. To insert iMovie (including iMovie '11/'09/'08) video into PowerPoint can be achievable by the assist of Bigasoft Total Video Converter for Mac so easily. You can realize to insert any video clip beyond .asf, .avi, .mpg, .mpeg, .wmv, be it YouTube video, FLV, MKV, MP4, etc to PowerPoint and embed the video.